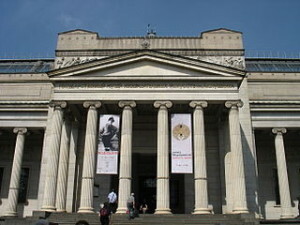 The Pushkin Museum of Fine Arts is the largest museum of European art in Moscow. Located right opposite the Khram Khrista Spasitelya. So if you have time to enjoy the beauty of the church is ever destroyed, do not forget to come to this museum. The museum was founded by an academic from the University of Moscow, Professor Ivan Tsvetaev who is also the father of the famous Russian poet, Marina Tsvetaeva. He managed to woo millionaire and benefactor Yuriy Nechaev Maltsov and architect Roman Klein art to provide full support for the construction of an art museum in Moscow. Construction of the building was completed in 1912. Building design created by Vladimir Shukhov and Ruman Klein, while financing the construction of a major museum supported by Yuriy Nechaev Maltsov. Tsvetaev dream became a reality when the museum officially opened to the public in May 1912 and was named Museum of Alexander III.After the Bolshevik Revolution of 1918 and the capital moved to Moscow, the museum’s collection is supplemented by a collection of the Hermitage Museum and the Museum Roumjansev. Some of the collection is a masterpiece of Veronese, Botticelli, Poussin, Tiepolo, Bouche, Vatto, Monet, Corot, Renoir, Van Gogh, Cezanne, Mattise, Gaugin and Picasso. Finally, to commemorate the big name idol Russian poet, Alexander Pushkin who have died, in 1937 the name was changed to the museum Pushkin Museum. Assorted collection of sculptures, paintings and applied arts began to eat it ancient history until now can be found here. Greatest triumph of the museum is found in the collections of European art since 1600, including the very popular collection of Impressionist and complete Prancsi and pascaimpresionis. The museum collection is nearing a collection owned by the Musee d’Orsay in Paris. Not only that, this museum also has a collection of ancient Egyptian and Hellenistic era until the Renaissance collection. It is estimated that the number of collection exceeds 500,000 items. You can visit the Pushkin Museum and the metro ride out in Kropotinskaya.